The new documents leaked by former NSA contractor Edward Snowden has exposed a United States secretive facility located near a remote town in Australia's Northern Territory for covertly monitoring wireless communications and aiding US military missions. The leaked documents have come from the massive trove of classified material stolen by Snowden from the US National Security Agency (NSA) in 2013 that exposed the extent of the US government's global surveillance programs. The newly released classified documents, obtained by The Intercept, contained references to a secretive facility, which was codenamed "Rainfall," but is officially known as the Joint Defence Facility Pine Gap. 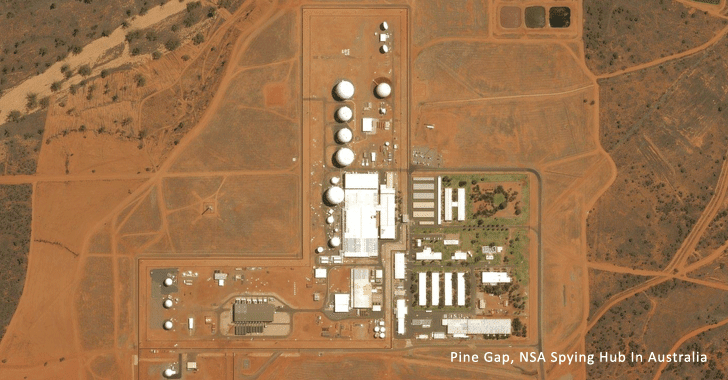 The documents reveal that the Joint Defence Facility Pine Gap, located outside Alice Springs, deployed cutting-edge satellite technology for detailed geolocation intelligence that helps the US military locate targets for special forces and drone strikes. The use of unmanned air vehicles, generally known as drones, by the U.S. military has previously been blamed for hundreds of civilian deaths in countries like Pakistan, Afghanistan, Yemen, Syria, and Somalia. As outlined in a secret intelligence document, Pine Gap's aim is to "support the national security of both the U.S. and Australia. The [facility] contributes to verifying arms control and disarmament agreements and monitoring military developments." However, in reality, Pine Gap has a far broader mission with powerful capabilities than the Australian or U.S. government has ever publicly acknowledged. The satellites used by the Pine Gap are described as being "geosynchronous"—likely positioned high in orbit at over 20,000 miles above the earth's surface—which are equipped with powerful surveillance technology to monitor wireless communications on the ground, like those sent and received by mobile phones, radios, and satellite uplinks. According to the leaked documents, these satellites collect "strategic and tactical military, scientific, political, and economic communications signals," and also keep eyes on any missile or weapon tests in targeted countries, steal intel from foreign military data systems, and provide surveillance support to United States forces. One of the secret NSA documents analysed by the Australian Broadcasting Corporation (ABC) suggests that the facility's role is not only to collect signals, but also to analyse them, as it "detects, collects, records, processes, analyses and reports" on almost everything—from surface-to-air missiles to anti-aircraft artillery and fighter aircraft. One mission even pilfered communications from the former Soviet Union, China, East Asia, South Asia, the Middle East, Eastern Europe, and territories in the Atlantic Ocean. In 2013, the Sydney Morning Herald reported that Pine Gap played a major role in controversial U.S. drone strikes, which had also resulted in the deaths of hundreds of innocent civilians. Richard Tanter, the University of Melbourne’s professor who has previously studied Pine Gap, told the publication that "Pine Gap will be contributing hugely in real-time to those operations, as well as in preparation for them." "So whether or not the Australian government thinks that an attack on North Korea is either justified or a wise and sensible move, we will be part of that. We'll be culpable in terms of the consequences," Tanter asserted. Under Trump administration, drone strikes and special operations raids have doubled, while simultaneously loosening battlefield rules to prevent civilian deaths in such air attacks. However, David Rosenberg, who worked inside Pine Gap as a team leader of weapon signals analysis for at least 18 years until 2008, confirms the facility's geolocation capability, claiming that preventing civilian casualties is a high priority. "One thing I can certainly tell you the governments of Australia, and the United States would, of course, want to minimise all civilian casualties," Rosenberg says. "Pine Gap does help to provide limitation of civilian casualties by providing accurate intelligence." It is not at all surprising to see Australia working closely with its U.S. counterparts to help conduct global surveillance since it is a key member of the "Five Eyes" alliance—alongside the US, UK, New Zealand and Canada—all openly shares secret intelligence reports.